Numerous reports are coming in from iOS users facing issues with updating or installing apps from App Store. 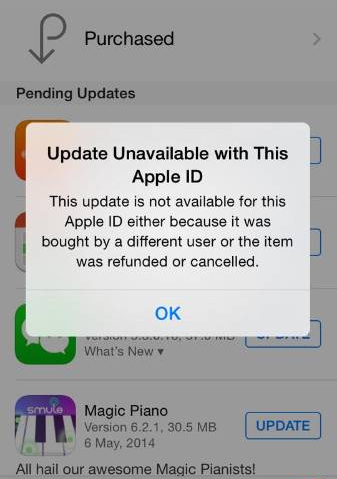 These Apple ID error messages are being reported by both the U.S. and international users. While Apple has not yet confirmed these reports of Apple ID error messages on its system status page, users report that Apple representative confirmed the issue being with Apple’s servers. This update is not available for this Apple ID either because it was bought by a different user or the item was refunded or cancelled.